Dr Kate is an experienced and engaging public speaker, seminar and workshop presenter with a wealth of knowledge in animal behaviour, learning, training, management and behaviour modification. Kate can develop and run seminars and workshops, tailored to your specific needs, on any subject related to animal behaviour, learning, body language, training, welfare and management. Please contact Kate for more information. If you work with animals and need an indepth understanding of the scientific principles underpinning animal learning, behaviour and training, then this workshop is for you! The content of this workshop can be designed to meet your needs and can include Operant and Classical conditioning; Targeting, Stationing, Capturing, Shaping, Chaining and Cues; Reinforcement, Punishment and Extinction; Applied Behaviour Analysis; Environmental Enrichment for captive animals; Animal Welfare. ”Kate provided staff at Melbourne Aquarium with a great understanding of theoretical and practical application to animal training. Our seminar was both fun and very educational. Kate presented the information in a way that was suitable for beginner as well as experienced animal trainers. 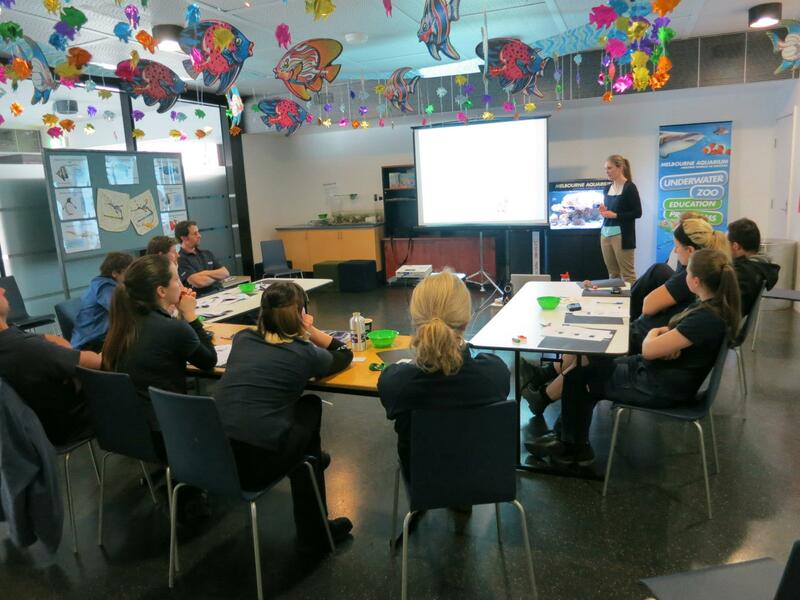 With fun activities, videos and observing in house practices, the staff enjoyed an educational workshop on animal behaviour and training.” Sarina Walsh, Bird Manager, Melbourne Aquarium. Dr Kate is an expert in the assessment of shelter dog behaviour as this was the focus of her PhD research. This experience has provided her with a unique and comprehensive understanding of the latest scientific advances in the field and the difficulties associated with implementing a new assessment protocol. One of the most important lessons she has learned is that animal shelters vary dramatically in terms of their design, staff education and experience, available resources, legislative requirments etc and there is no one assessment protocol that will suit every animal shelter. Dr Kate works with individual shelters to understand their specific needs, limitations and available resources and develops an assessment protocol to suit their requirements. If you work at a shelter and you’re interested in the Shelter Dog Behaviour Assessment Workshop, please contact Dr Kate for more information. “I would like to say a huge thank you to Kate for delivering two days of tailored training for our animal attendants. We required training on the best practice methods to deliver consistent, positive based training for the animals in the shelter and to use this knowledge to solve common problem behaviours to increase adoptability of our shelter animals. The sessions consisted of practical and theory and were focused on solving common behavioural problems with positive based training. Kate has an absolute wealth of knowledge and is an exceptionally talented and compassionate behaviourist. The training was engaging, interactive and tailored specifically to our needs, in an area that is lacking in availability for animal shelters. We could not have been happier and are thrilled to report that our shelter animals are reaping the benefits of Kate’s incredible training and the implementation of her recommendations.” Jen Cairns, Shelter Manager, Blue Cross Animals Society of Victoria.